It’s exciting to make a difference to a client’s marketing but it’s just damn great when that client has a world-shaking product. 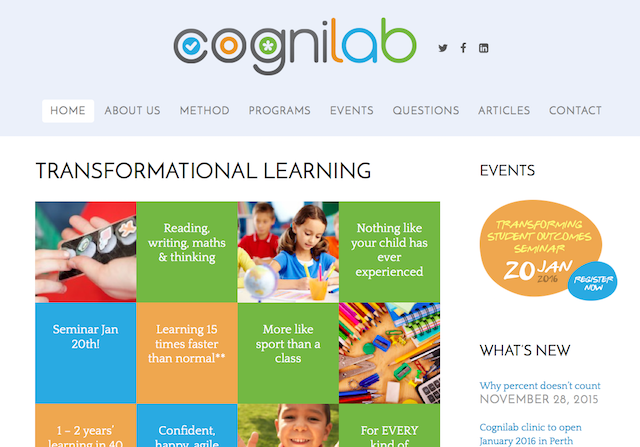 Cognilab brings the latest in cognitive science to educational training for kids. For me, the nice thing about working with new businesses is the ability to impact core messaging. So rather than “a unique combination of applied behavior analysis, precision teaching, direct instruction, curriculum-based measurement, and relational frame theory”, we’re now saying “produces one to two years’ learning growth in 40-50 hours of instruction”. I have a special hatred of the word ‘unique’. We’ve been able to move from fairly dense, scientific discourse to a small number of meaningful and easy to understand points. We put it in a visual context that does not overwhelm. It’s about chunking down a complex product offering into digestible amounts. How you do that is put yourself in the shoes of the people who’d benefit from the service. And pretend they have limited time and attention. What matters most to them? Give me one phrase. If you have kids who are ambitious for a particular career and don’t yet have school results lining up consistent with that, you should go to the seminar Cognilab are running next week: the inventors of the program are briefly in Perth. I worked with Martin Firth from Embersketch; he is smart and accommodating. Highly recommended.